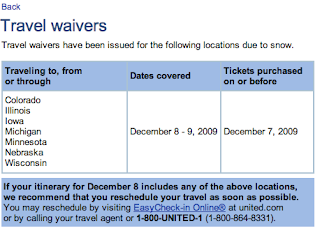 Below is my post about traveling during winter storms and I discussed airline "waivers." If you have never seen one, here are United's for today and tomorrow. When they are in effect, you can make all kinds of last minute changes. For example, if you were booked on United going from Dallas to Buffalo, you could ask to reroute so as to change planes at Dulles rather than Chicago and miss the winter storm. Complete story: "Lemon, No One Flies Unmedicated These Days." UPDATE: Southwest Airlines ("SWA") has average delays of 4 hours, 58 minutes (listed here as 298 minutes) at Chicago Midway (MDW). There will be people who spend the night there. This is why it is so important to be proactive in these situations.